This is a wonderful recipe for using fresh corn from your garden or local farmer’s market. 1. In a 4-quart saucepan over medium heat, heat the oil; add the corn, pepper and onion and cook for 6 minutes or until the vegetables start to brown. 2. Add the rice; cook for 30 seconds, stirring constantly. Stir in the broth and sage; heat to a boil. 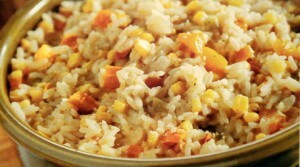 Reduce the heat to low; cover and cook 20 minutes or until the rice is done and most of the liquid is absorbed. 3. Stir in the soup; cook 2 minutes more, stirring occasionally, until heated through. Sprinkle with Parmesan cheese. Makes 8 to 10 servings. * You may substitute 1 cup of drained, canned whole kernel corn for fresh corn, if desired.